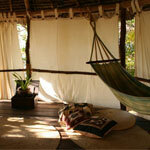 Set like jewelries in tranquil coral-filled waters, Zanzibar and Mafia islands are fertile and luxuriant paradises. With the aroma of exotic spices filling the air and long, white sandy beaches bordering crystalline lagoons, a stay on theses uniques islands is the perfect way to round of the trip of a lifetime. Nestled in the heart of Stone Town, Kholle House stands as a quiet oasis offering you a private sanctuary from the bustling city life. 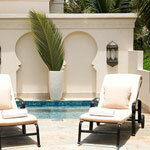 Our ten room luxury boutique hotel is designed in an elegant fusion of Swahili and French-Creole. Refresh yourself in our swimming pool or enjoy the breathtaking 360° view of Old Stone Town and the Indian Ocean from our roof top tea house. Kisiwa House is superbly located on a quiet street in the heart of Stone Town, a UNESCO world heritage site, within easy walking distance to significant landmarks, museums, antique shops and restaurants. Stone Town is now home to the new MASHARIKI PALACE Hotel. Created by the first sultan of Zanzibar almost 200 years ago, the domicile of the Sultan's religious councillor is now restored beyond its former magnificence. The MASHARIKI PALACE Hotel is a privileged residence for travellers choosing refined hospitality in a historical setting. At Ocean Paradise Resort Zanzibar, you will be greeted by a blaze of colour as you sweep down the imposing driveway, saluted by a Masai warrior as you pass through the entrance gate and be captivated by the azure blue sea. Mature coconut palms swinging in the breeze, white sandy beach, beautiful landscaped gardens, traditional style round chalets with pitched makuti roof, a stunning waterfall feature and the largest swimming pool in Zanzibar are just some of the sights that await you. Breezes lies along a pristine and untouched beach on the South East coast of Zanzibar island, which is the most quiet and untouched part of the Island chosen by the reputable Conde Nast Traveler magazine as one of the top 30 beaches in the world. Famous for its attention to detail, intimate and private dining, its beautiful Zanzibari decor with stunning carving, glistening brass and rich fabrics creates an elegant and unique atmosphere. Ras Nungwi Beach Hotel overlooks a sparkling expanse of iridescent Indian Ocean, a cluster of whitewashed and palm thatched cottages in rich tropical gardens. Infused with the laid-back, exotic yet ultimately natural spirit of Zanzibar, this is the place to relax and enjoy all that this extraordinary part of the world has to offer. The lush gardens drop down onto one of the finest and most unspoilt beaches on the island, which in turn is fringed by a wide and thriving coral reef. Seven bungalow suites, perfectly blended with the surrounding tropical garden, overlook the infinite hues of blue of Chole Bay, the core of Mafia Island Marine Park, Tanzania. Pole Pole, it is the perfect place to relax after a safari, and the ideal base for exploring the underwater wonders of Mafia Island. Located along the Bwejuu – Paje beach that was named as one of the top 30 in the world by the prestigious Conde Nast Traveler magazine, Baraza is Zanzibar’s most exclusive boutique resort. With just 30 villas, this stunning fully inclusive resort evokes the heritage of Zanzibar dating back to the era of the Sultans. 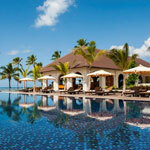 Welcome to Zanzibar’s most exclusive, private resort with just six villas in a personalized and intimate setting…. the perfect, romantic getaway. The Palms is a sanctuary for those in search of tranquility…a place to stimulate the senses and experience the very best of the Island of Zanzibar. The Palms is one of the world’s most romantic all-inclusive resorts, says Travel + Leisure. Once the haunt of Sultans, musicians, and artists, Zanzibar is tipped to become the new “in” place, and what better place to be seen at than The Residence Zanzibar. Swaying coconut palms, azure-colored waters and a cooling tropical breeze showcase the island’s newest and chicest arrival, with 80 acres of lush forest, gardens and a mile of white sand beach embracing the resort’s pool-villas and exquisite spa (featuring Paris-based Carita products).